An atom is present at the most basic level in everything we see around us. In fact, every living organism is composed of atoms. Every non-living thing around you such as tables, chairs, water, etc is made up of matter. But the building blocks of matter are atoms. Therefore, living or non-living, everything is composed of atoms. Let us take a look at the structure of atom. Atom is a Greek word which means “indivisible.” The Greeks believed that matter can be broken down into very small invisible particles called atoms. Greek philosophers such as Democritus and John Dalton put forward the concept of the atom. Democritus explained the nature of matter. He also proposed that all substances are made up of matter. He stated atoms are constantly moving, invisible, minuscule particles that are different in shape, size, temperature and cannot be destroyed. Learn the concept of the Atomic number here in detail. Atom is the smallest unit of matter that is composed of a positively charged centre termed as “nucleus” and the central nucleus is surrounded by negatively charged electrons. Even though an atom is the smallest unit of matter but it retains all the chemical properties of an element. For example, a silver spoon is made up of silver atoms with few other constituents. A silver atom obtains its properties from tiny subatomic particles that it is composed of. Atoms are further arranged and organized to form larger structures known as molecules. Atoms, molecules adhere to the general chemistry and physics rule even when they are part of living breathing human body. Let us study atoms and molecules to further understand how the atoms react, behave and interact in cells form an essential part of living and nonliving world. Learn more about the Thomson’s Model of Atom in detail. 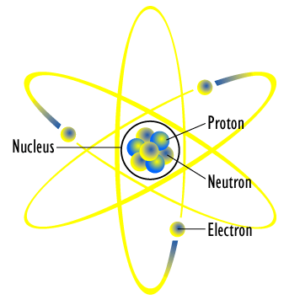 The tiny atomic nucleus is the centre of an atom constituting positively charged particles “protons” and uncharged particles “neutrons.” On the other hand, the extra nucleus part is a much larger region which is composed of a cloud of negatively charged particles called an electron. Electrons revolve around the orbit or centre of the nucleus. The attraction between the protons and electrons holds the structure of an atom together. Learn how electrons are distributed in different shells in detail here. Generally, all atoms are composed of these three subatomic particles except hydrogen. Hydrogen is an exception to all atoms as it just contains one proton and one electron but lacks neutrons. The number of protons indicates what element an atom is whereas the number of electrons indicates the type of reactions will happen in an atom. The atomic nucleus in the structure of the atom is composed of a fixed number of protons and the proton attracts the same number of electrons thereby making an atom electrically neutral. Ions are formed by addition or removal of electrons from an atom. Learn about the Disadvantages of Rutherford’s Atomic Model here. An electron is represented “e” and it is known to contribute to the negative charge of an atom. The absolute charge of an electron is the negative charge of 1.6×10-19 coulombs. The relative mass of an electron is 1/1836, thus the mass of an electron is very small and is considered as 0. Proton was discovered by Rutherford when he conducted the famous gold foil experiment. Initially, in 1886 Goldstein discovered the presence of positively charged rays while conducting an experiment in the discharged tube by using perforated cathode. The rays were named as anode rays or canal rays. A series of experiments led to the discovery of protons. Protons are known as the particles that contribute to the positive charge of the atom. Proton is represented by “p”. The absolute charge of a proton is the positive charge of 1.6×10-19 coulomb. The mass of a proton is 1.6×10 -24 g and is considered 1 that is mass of a hydrogen atom. Neutron was not discovered until the year 1932. It was discovered by James Chadwick by using scattered particle to calculate the mass of the neutral particle. The subatomic particle “neutron” is present in an atom’s nucleus. Neutron is represented by “n” and is considered a neutral particle. The mass of a neutron is measured to be 1.6 x 10 -24 g.
Gram is not a very appropriate unit for the calculation of such tiny subatomic particles. Therefore they are alternatively calculated in Dalton or amu (atomic mass unit). Neutron and a proton have a mass that is nearly 1 amu. Learn more about Bohr’s Atomic Model here. Question: What is the net charge of an atom? Ans: There is no net charge of an atom. Electrons are the negatively charged particle whereas protons are the positively charged particles. The equal positive charge of the proton and the negative charge of the electron cancel each other. Therefore, the atom has no net charge. In an atom that is neutral, the number of electrons revolving around the nucleus and the number of protons inside the nucleus are equal in number.